The City of Holly Springs — in Georgia’s Cherokee County — almost tripled in population between the census taken in 2000 and the latest one in 2010. Despite the growth, it still has that small town personality and the best that Southern hospitality can offer. 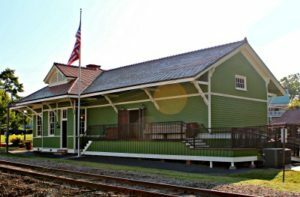 The Holly Springs Train Depot is a source of civic pride. The depot is a marvelous remembrance of the days when traveling was more than sitting in traffic. In the 1990s, the City, heartbroken over the state of disrepair that had fallen over the Depot due to the lack of funds available for upkeep, applied for and received a grant from the National Transportation Enhancements Fund. This grant … brought about the restored depot as it stands today, in all of its former glory … The renovation went so well, that the project was featured in the National Transportation Enhancement Clearinghouse’s publication. You might find yourself looking for Floyd the Barber or Deputy Barney Fife. The City of Holly Springs only seems like Mayberry — but it’s a grown-up version. Ladies and gentlemen, rest and recreation, and all the comforts of home and the Big City abound in Holly Springs. When you cannot take peace and quiet any longer, you are welcome to head for the bright lights and fancy nights in nearby Atlanta.